Mashed Cauliflower is a Great Alternative to Mashed Potatoes! Mashed cauliflower is becoming a popular substitute for mashed potatoes - especially for health conscious people. Steam, boil or bake the cauliflower, then mash or puree. Top with your favorite potato toppings and you will hardly notice the difference. Here's a little more information. And yes, purple cauliflower will work as well. Directions: Cut the cauliflower, including the core, into 1-inch pieces. Bring a large pot of water to a boil and salt lightly. Add the cauliflower and cook over medium heat until completely tender, 20 minutes to 30 minutes. Drain cauliflower in a colander. With a bowl or small plate, press on the cauliflower to remove all water. Toss the cauliflower and continue pressing out the water. This step is very important to the texture of the dish. Transfer the cauliflower to a food processor. Add the cream and puree until completely smooth. If you like a chunkier texture, mash by hand, adding the cream after cauliflower is mashed. Return to pot. When ready to serve, heat over low heat, stirring constantly. Add the butter, parmesan and cream cheese and stir. Season with salt, if necessary. Serve immediately. Directions: Grate raw cauliflower in food processor (or chop into manageable size pieces). Steam until very tender - usually takes about 20 minutes for the grated cauliflower. Using food processor fitted with blade, puree the steamed cauliflower until smooth. Add copious amounts of butter and virgin coconut oil (3 to 4 tablespoons of each), salt and pepper to taste. Good and good for you. Cool temperatures are needed for large, high quality heads. Even soil moisture is needed to avoid “buttoning” or small heads. Add additional organic fertilizer when the small inner leaves begin to cup and start to form heads. Some gardeners recommend tying the larger outer leaves together over the head as it forms. This will prevent sunlight-caused discoloration of the head; I think this is a total waste of time. Does fairly well in heavy clay soils. 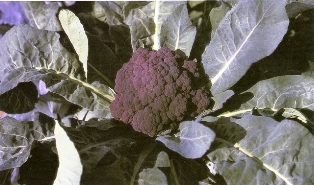 Click here for more information on cauliflower from my book, Texas Organic Vegetable Gardening: The Total Guide to Growing Vegetables, Fruits, Herbs, and Other Edible Plants the Natural Way.